This is the language written (provided below) by REA Auctions as it pertains to the 1938 Lou Gehrig road jersey that I evaluated. 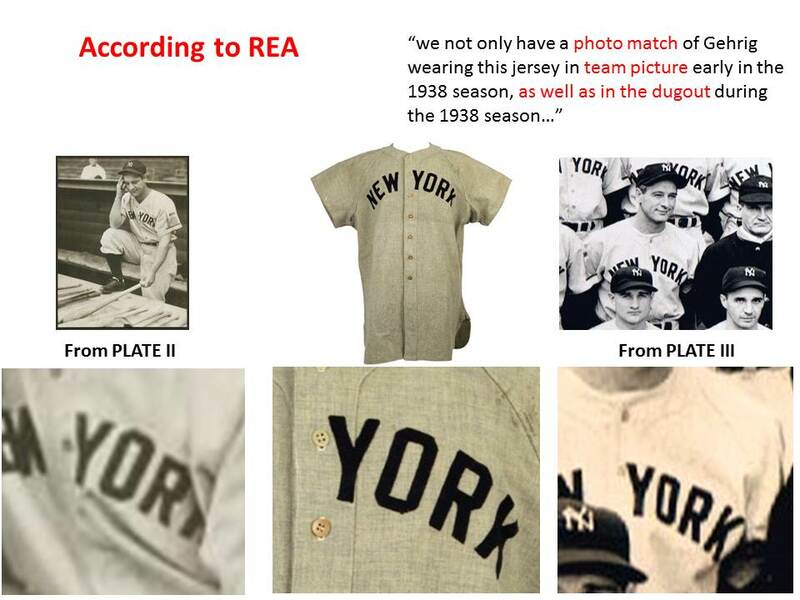 REA’s claims about placing this jersey specifically to the images I provided of Lou Gehrig in the 1938 World Series are their comments and theirs alone. Please know that when you see the use of the pronoun “we” by REA, I am not part of that grouping. “We are quite certain that the photo of Gehrig at bat in the 1938 World Series pictures him wearing this very jersey. The cut of the number “4″ is unique to every Gehrig jersey. The number “4″ on this 1938 jersey is very distinctive. We have taken the time to carefully examine every image of Gehrig showing the number “4″ on his back that we have been able to locate, including images that we knew were from earlier years. The point of the exercise was not just to see if we could find an apparent match; in the alternative, the point was also to see if we could find an image of the number “4″ on Gehrig’s jersey from a different year that could possibly be mistaken for the number “4″ on this 1938 jersey. We could not. The number “4″ on all the other many images was easily identified as cut differently and clearly not a match. The only photo of Gehrig’s number “4″ that was consistent, or even close to our eye (let alone a perfect match) was the photo of Gehrig at bat in the 1938 World Series. This is not a coincidence”. While I have no doubts about the authenticity of this jersey, it is my opinion that REA’s comments about being able to make a definitive claim based off imagery analysis are not objectively defensible, and as such are largely without merit. Their stated assumption is that and I quote, “The cut of the number “4″ is unique to every Gehrig jersey. The number “4″ on this 1938 jersey is very distinctive”. I found Mr. Lifson’s response interesting on a number of levels. First of all, the only images they show or reference are the ones I provided as part of my work. As a matter of fact, I was asked for them just a week before REA posted their analysis as part of their on line preview. 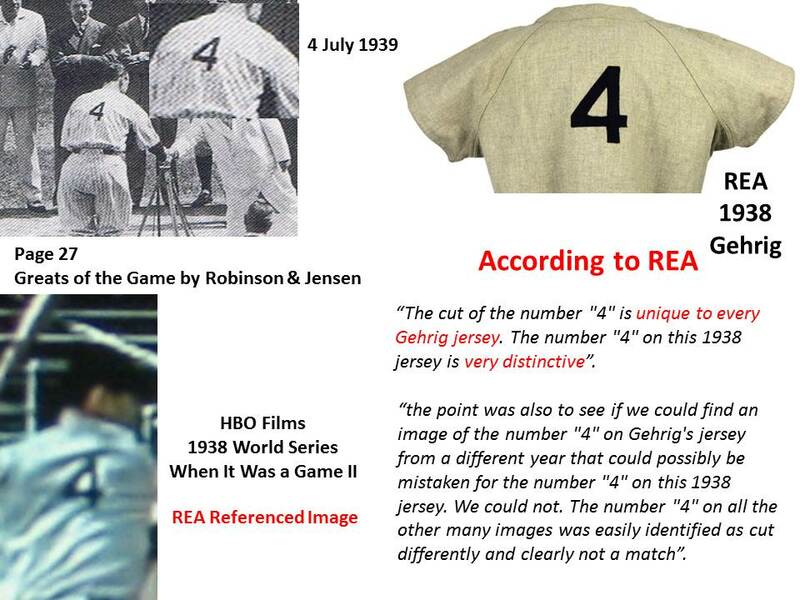 This caused to me to ask myself where are the countless images REA reviewed to come to their stated conclusion that “The cut of the number “4″ is unique to every Gehrig jersey. The number “4″ on this 1938 jersey is very distinctive”. Maybe they have a much more robust reference library than I do. Quite possible, I don’t know. This then prompted me to consider what sort of sampling and supporting photographic evidence should be required to support this claim by REA. Allow me to share some of the images I came across and then you can decide for yourself if in fact the “The cut of the number “4″ is unique to every Gehrig jersey. The number “4″ on this 1938 jersey is very distinctive.” REA’s WORDS, NOT MINE. While I have included images from easily accessible on-line sources, I have also included both print and film references from my library. I have no idea of the size, nature, and scope of the REA search, only that Rob Lifson conveyed to me that their search and research consumed “many weeks and many hours”. For this exercise, my time on the clock was just over seven hours and that included making the PLATES and writing this article. What I came away with is that the cut of the numeral 4 is fairly consistent and far from “unique” and “distinctive” for “every Gehrig jersey”. You may notice I also looked at and included images of home jerseys as well since what the REA theory purports is that there should be no qualifiers with respect to either home or road by way of their claim “The cut of the number “4″ is unique to every Gehrig jersey”. 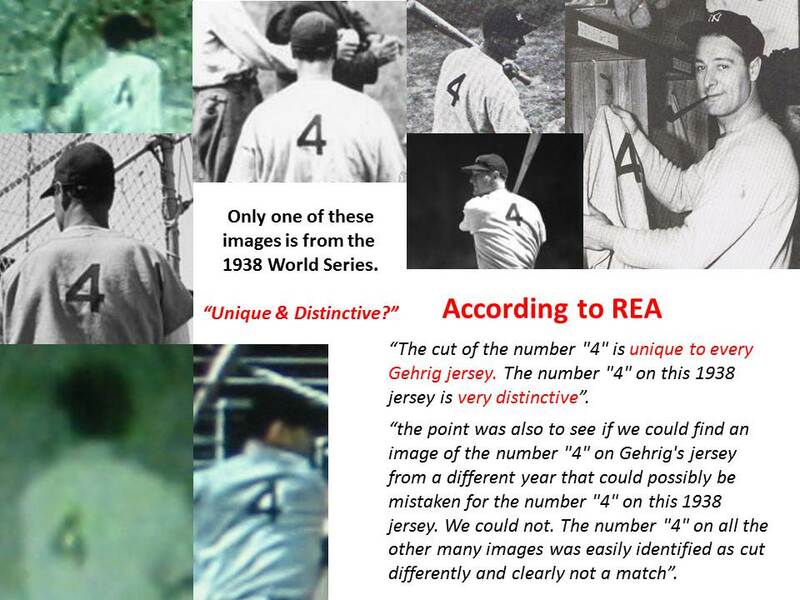 REA's claims of a photo match on the 1938 Gehrig jersey are contradicted by the photos they include in their own lot description. Secondly, since I clearly identified them as different jerseys, then how could REA use both photographs to claim a “photo match.” Maybe it’s just me, but how can REA definitively say a shirt is the same one in both pictures when the pictures show two different jerseys? Once again, you will have to ask Mr. Lifson and REA as those are their words and not mine. My message in all of this is that if you are serious buyer then take this jersey very seriously. Although there are some condition issues, it is one of only a handful of legitimate Lou Gehrig jerseys out there and the likely population of good Gehrig jerseys can only get smaller. This population has been cut down significantly as I have evaluated three others that were found to be problematic for any number of reasons. If you are in the market, then buy the jersey for what it is based on what you can objectively see and know. I think you’ll be thrilled and lucky to have it as the display appeal is incredible and the conservation work in the sleeves is museum quality. With that said, I for one am not a “buyer” of the theory that “The cut of the number “4″ is unique to every Gehrig jersey. The number “4″ on this 1938 jersey is very distinctive” any more than I subscribe that you have a “photo match” to images of two different jerseys. What do I base my opinion of the REA theory off of? The same methodology that REA purports to have used by examining the #4 on the back of Lou Gehrig jerseys and other associated images. I guess another difference is that I have provided the body of work to the collecting public so you can reach your own informed opinion. This too is something I feel is a more than reasonable expectation from any responsible auctioneer, MEARS Auctions not excluded from this requirement. 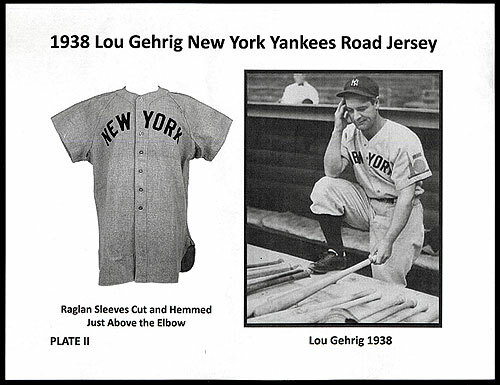 If you have questions or concerns about REAs claim, supporting evidence or research methods associated with this 1938 Lou Gehrig New York Yankees road jersey, then you’ll have to take them up with Mr. Rob Lifson and REA. Mr. Lifson has conveyed to me that “We have always made the authentication process a priority.” As such, since REA has authenticated this jersey themselves with their “unique” and “distinctive” theory and imagery analysis expertise to being the jersey Gehrig is wearing in the 1938 World Series, then it reasonable to expect this definitive claim is supported by more than an auction description. At the end of the day, it’s up to the collector to decide who and what they want to believe and why based on what they can see and evaluate for themselves…In my book, that’s the way it ought to be. sounds like you are nitpicking to me. Didn’t mears say this jersey is a museum quality legitimate Gehrig jersey? As the person who evaluated this uniform, I do think this jersey is worthy of a museum display and the conservation work to the shoulders is museum quality. In this we are in agreement. What I guess we don’t share is the understanding of the word “nit-picking.” Webster’s defines this “minute and unusually unjustified criticism.” I do not see claims made by an auctioneer that have been proven to be both unfounded and based on unsubstantiated work and or imagery analysis to be a “minute issue”. Especially when these same claims have a material impact on bidding decisions and dollar thresholds for bidders based on how the item is being represented. I don’t consider the responsibility that any auctioneer has to the bidding public to represent any item in an objectively manner , especially an item of such historic significance and “museum quality” as being a “minute” point or issue. When the auctioneer chooses to do this or make claims about an item that are not in line with objective and empirical analysis or evidence they posses, and lead the collecting public that believe the item is something other than what is can proven to be, and are criticized for it, I would not consider this to be “unusually unjustified.” When it is their theory, work, and claim, then the responsibility for their theory, work, and claim are theirs and theirs alone and they accountable for it. If all of this “nit-picking”, then I guess I’ll have to take this up with Webster’s. Photo matching is obviously not REA’s forte…however none of this info will keep anyone from bidding on a legit Gehrig jersey. I’m looking forward to their full catalog arriving. After reading on here and another site about the horrors of uniforms generated from Barry Halper’s sale and the fiasco with Ty Cobb biographer Al Stump, it is apparent that so much memorabilia is just a forgery with a story. Shame on them! From what I read in Dave’s article, it seems one of his big issues was that the auction house is claiming to have photo matches, when it appears they don’t. And the claim is that one photo match shows Gehrig in the uniform that “could be” from the last World Series game of his career, Game 4 of the ‘38 WS. Hope I’m not nit-picking here, but that auction claim would also be impossible, since games 3 and 4 of the 1938 Series were played at Yankee Stadium and Gehrig would have worn pinstripes, not a road uniform. In my opinion, it is nothing other than another Halper bogus job, just like the so called Mantle and Dimaggio jerseys, fakes. While you are certainly entitled to your opinion, as someone who actually spent a great deal of time with the jersey, what do you base your opinion on that it is a fake? This is not an opinion I share nor is it a conclusion I came to. The basis for my opinion was grounded in imagery analysis, comparative analysis with previous Gehrig uniforms I have evaluated as well as on hand period Spalding 1938 professional road fabric samples. The uniform was examined utilizing a digital microscope, UV lighting, and a light table. I also provided some information and visual references on the history of the uniform, which facilitated “change detection” analysis that allowed me to comment on the current condition of the jersey vs the condition it displayed in 1991. I found nothing in my evaluation and research to suggest this jersey is a fake. I did find issues with certain facets of the jersey that effect grade (sleeve wear/ conservation, buttons, and patch), but found none that call authenticity into question. The intent of my article was part informative and part editorial. The information I provide was about the jersey. The editorial aspect was commentary on my position that public comments as to the material representation of an item need to be substantiated if they are to be seen (both opinion and the person/organization offering them) as credible. So once again, what do you base your opinion on that this jersey is a fake? Please know this is not an opinion I share.